Transparency is desperately needed in many areas of our society, with the healthcare industry being a prime example among many. Colorado Public Television (CPT12) is once more at the cutting edge with its upcoming presentation of the documentary Burzynski: The Movie. Please forward this announcement, and let your friends know this presentation will be streamed. Do not miss this groundbreaking film! And please, donate to this highly independent station, which is once more charting a path for other media to follow. CPT12 will be airing a documentary film that challenges the Food & Drug Administration (FDA) and Big Pharma and gives hope to cancer patients, formerly thought to be incurable, by alerting them to nontoxic alternative treatments. 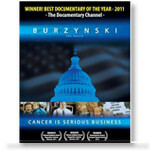 Colorado Public Television (CPT12) will air Burzynski: The Movie, on March 7 at 7:00 PM.